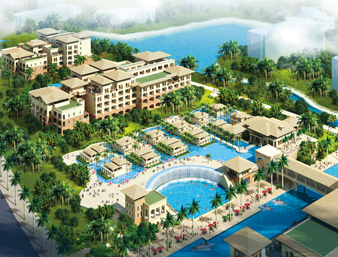 Wyndham Grand Plaza Royale Hainan Longmu Bay, the newest addition to Wyndham’s signature brand portfolio in China is expected to open in the first quarter of 2013. Situated on the South-west coast of Hainan Island in the heart of the new International Resort development, the Wyndham Grand Plaza Royale Hainan Longmu Bay will be the 1st International 5 star hotel at the Longmu Bay development. Approximately one hour’s drive from the Sanya Phoenix Airport and 20 minutes from the Hainan Jiangfengling National Forest Park, the Wyndham Grand Plaza Royale Longmu Bay offers a perfect place for business, meetings, conferences and leisure. The opulent décor enriched by Southeast-Asia influences ensure the guests can enjoy an atmosphere of absolute tranquility in 362 oversized luxuriously appointed guest rooms, including 38 suites and 1 presidential suite. The 6 Restaurants and Bars offer views of an eco-friendly oasis with extensive water features and gardens both inside and outside. From a hearty breakfast, to after-dinner cocktails and everything in between, we create options that are catered especially for you. The hotels 1,080 square meter pillar-less Grand Ballroom and 8 multi functional Meeting Rooms are all equipped with high-tech audio-visual equipment to meet every events needs.